We can either rebuild your old unit or supply you with a complete assembly. While parts availability for our favorite classic Minis continue to be reasonable, major components such as cylinder heads, transmissions and engine blocks are no longer being manufactured anywhere in the world. We offer a wide range of services from a simple 'valve job' or 'synchro replacements' to complete rebuilding. We also have a very wide range of cores if your old units is not serviceable! 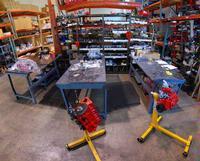 If we are rebuilding an engine for you then you can take advantage of our "We Ship-It Service". We'll send you a wooden crate that you snap together. You then bolt your motor into the crate. We arrange for pick-up, refresh the unit as required and return it to you in the same crate! We will then arrange to have the empty crate picked up and returned to us. So, if you're in need of any services for your A-series Engine don't let a shop take forever with your parts and service. Get the right parts, from the right people, the first time. 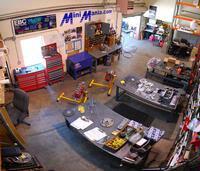 Let Mini Mania get you, and your Mini, back on the road Quickly! Re-manufactured cylinder head has been set up for unleaded fuel. New valve guides and seats and ready to install on your 1275cc engine! Big bore block, crank, rods and pistons. 1380 assembled shortblock consists of A-Plus block and crank machined to 73.5mm and assembled with pistons, rod bolts, bearings, and our special camshaft. We've done the hard work, you can do the final assembly with your favorite head, transmission and ancilleries. Rebuilt gearbox. 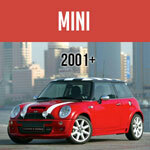 The 'rod change' gearbox was the final and best design for use with the Mini. 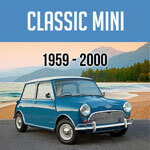 The rod-change transmission was used in almost all Minis manufactured after January 1973. Our rebuilt gearboxes have all new bearing and synchros & include the 3.44 differential.